So this Waiting on Wednesday is all about Girl of Nightmares by Kendare Blake. This is the follow up novel to Anna Dressed In Blood. I am so excited for this book, I cannot really adequately describe it. I am dying for some more Cas and Anna. "It's been months since the ghost of Anna Korlov opened a door to Hell in her basement and disappeared into it, but ghost-hunter Cas Lowood can't move on. His friends remind him that Anna sacrificed herself so that Cas could live--not walk around half dead. He knows they're right, but in Cas's eyes, no living girl he meets can compare to the dead girl he fell in love with. Cas doesn't know what happened to Anna when she disappeared into Hell, but he knows she doesn't deserve whatever is happening to her now. Anna saved Cas more than once, and it's time for him to return the favor." I really cannot wait to get my hands on this book! 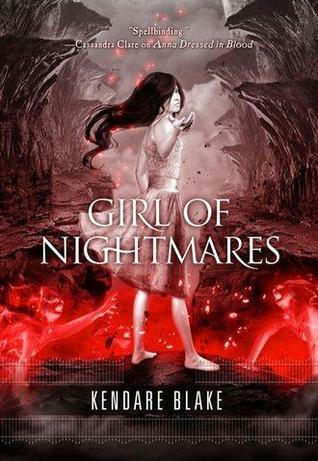 Girl of Nightmares will be released on August 7, 2012. I love the black and red cover. Great pick, thanks for stopping by my wow and following my blog. Your blog is cute and i followed you back..look forward to sharing books with you. I still need to read the first book! It's sitting on my shelf waiting for me. I love the cover, its kind of eerie too! Sounds interesting and I might have to look into it! Thanks for stopping by my blog, I'm a new follower! Nice pick! I have Anna, but still haven't read it. Can't wait! I wasn't really that keen on Anna Dressed in Blood, but I think I might give this a go and see if I enjoy it more. I really love the red cover, though. I still need to read the first one, but I have wanted to for ages now. Love the blog! I followed on GFC. Reading this one right now and LOVING it. We're talking about upcoming sequels in our WoW. Good pick!! I loved Anna Dressed in Blood ~ hope this one lives up to it! I am totally DYING for this book!! Words can't explain my excitement. I really loved Anna Dressed in Blood, and I'm pretty sure that this book will live up to the first book. I just hope it does! Another book from a series I really need to read.